MELBOURNE: An imperious Novak Djokovic won a record magnificent seventh Australian Open title by routing Rafael Nadal 6-3, 6-2, 6-3 Sunday with a display of flawless tennis. The Serbian world number one dominated the Spanish second seed to win his 15th Grand Slam title in just 2hr 4min on Rod Laver Arena. It put Djokovic, 31, out on his own ahead of Roger Federer and Roy Emerson, who both won six Australian Open men’s singles titles. Djokovic dropped to his knees and kissed the ground after vanquishing his greatest rival. “I’m just trying to contemplate on the journey in the last 12 months,” said an emotional Djokovic, pausing for breath to compose himself and not become tearful. “I had the surgery exactly 12 months ago,” he added, referring to an elbow operation that saw him slump out of the world’s top 20 before bouncing back to win Wimbledon and the US Open. “To be standing now here in front of you today and managing to win this title and three out of four Slams, this is amazing. I am speechless.” The pair’s only previous final in Australia, in 2012, developed into a record-breaking 5hr 53min slugfest-the longest in Grand Slam history. Djokovic noted that the duo had both endured injury-ravaged 2018 campaigns. “Obviously a tough match tonight, but … you came back from an injury that took you out from the tour since September last year,” Djokovic said of Nadal. “You’re showing to me and to all your other colleagues and many young tennis players around the world what is definition of the fighting spirit and resilience.” The Spaniard had not had his service broken since the third set of his first round match but that streak ended in a flash as the Serb came sprinting out of the blocks. The second set followed a similar pattern, with Djokovic racing through games on his own serve, while Nadal struggled to hold. The pressure told in the fifth game and Djokovic broke again when Nadal hit a lob volley long after an exchange at the net. 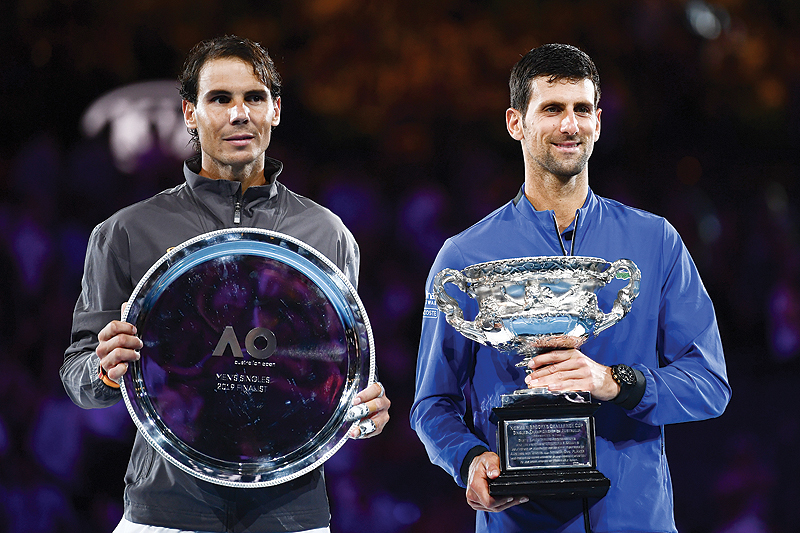 The statistics were as telling as the scoreline: Djokovic had served eight aces to Nadal’s one and made just four unforced errors while the Spaniard had coughed up 20. When Djokovic broke again in the third game of the third set it was just a matter of how quickly he would finish off Nadal. The end was swift, as Djokovic withstood one break point at 3-2 before administering the last rites in a flurry of winners off both wings. Victory extended his win-loss record against Nadal to 28-25 and squared the Grand Slam final count between the pair at 4-4.